The a-JAYS Three bundle includes 5 pairs of soft silicone tip sleeves designed to envelop the earpiece and prevent ingress of exterior ambient noise. They claim this technology reduces leakage by up to 40dB. On one hand this offers better S/N ratio (signal to noise ratio) in busy environments, but make make them unsuitable in situations on the move where it is better to keep alert to external cues for personal safety reasons, like tube (subway) travel. They're packaged with a couple of adapters (including flight) and the sturdy packaging also contains a neat carrying case of the shell variety. A new miracle from the Swedish earphone wonder. Innovative and passionate with extremely good sound quality, as always. We have got a special ear for music and many musicians have their ears on us. This time around we think that we made what could be the most price worthy in-ear phone in history." Your old scribe loves hype and especially breathtaking chutzpah. "There is no rest for the a-JAYS Three, not even for a single second. It will join you on your daily music journeys and make sure it delivers a thumping bass with its newly developed 8.6mm TCD neodymium speaker. 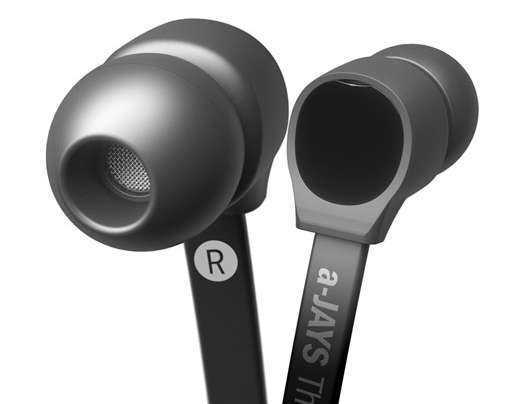 With the innovative, stylish and tangle-free cable you will very quickly realize why a-JAYS easily outplays the competition." "The a-JAYS Series gives up a rich, deep bass response and will help you to discover your music all over again. The rhythm sections in your favourite tunes will be uplifted and reinvigorated; music has never been so much fun." Your old scribe has never been a fan of in ear headphones and has never enjoyed any part of the whole experience of sound being pumped directly into the ear canals. Big circumaural cans that seal around the whole pinnae have their place for private listening or leakage prevention during recordings but for pleasure open backed on-ear types tend to be less fatiguing. However, in the twenty-first century it is probable that more music is consumed this way than through loudspeakers. Hence some experts with younger ear canals have been recruited for this test. 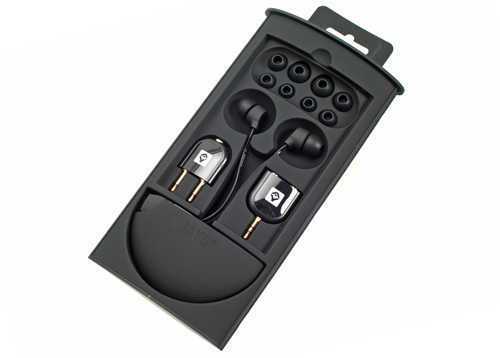 Expert in-ear Listener 2 compared the Ajay Threes with the Apple iPhone ear buds that have rapidly become the industry standard. 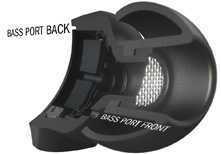 Bass is much better than the iPod headphones, which are really weak in this area. Pitch is more explicit and bass is audible through the bones of the listener's skull with the Ajay Threes. Bass rhythm is up to speed and well defined; Guess I Got My Swagga Back demonstrates the excellent bass extension. The treble verges on sharp, with certain notes exciting a narrow Q but strong resonance. In Mr Postman by Cragga the high notes tweak out. This is still better than the iPod phones because listeners can actually define the notes in the treble, rather than the tinny mess in your ears offered by the iCans. Vocals are fine, sounding like real human beings. Individual words and emphasis on the subtleties of delivery are a great improvement. One criticism in use is that the surface texture of the cable sheath tends to grip clothing and drags one ear piece out with movement. However, the self untangling design of the wire really works. This is an excellent asset for those who like to fall asleep listening, as in this test. The external noise exclusion is so good that Listener 2 used them to block the sound of the house burglar alarm outside his window until morning when it could not be disabled one night due to a fault. These cans excel with material like Hip Hop, Rap, Grime and Dubstep. "Compared to these the iPod ear buds produce ear vomit"
Also some Philips were available for comparison. They didn't compare with the a-jays. Nuff said. Arvind likes in ear headphones and your old scribe doesn't. However, the market for these is not audiophiles like Arvind but yoof like my sons. Even though I own and use an iPhone, I rarely listen to music on it. The iPod headphones have only been in my ears once. Hence turning this review over to the next generation. As the likely purchasers of a product like this, they are the final arbiters. Unlike most of their generation they have lifetimes' exposure to audiophile systems, actually hearing Nirvana's In Utero in utero. They give the Ajay Threes the thumbs up and Listener 2 has adopted them as his reference. Unfortunately they didn't survive the rigours of teenage life beyond 9 months. Older readers will be shocked at this but Apple's own iPod cans generally give up after a couple of months so the AJays lasted over 4 times as long as the industry standard. Inevitably, perhaps, these in ear phones were tested to destruction. However, the rigorous TNT-audio.com destructive testing regime established that these headphones have a service life way beyond the established competition. Contemporary listeners with an audiophile upbringing found these cans among the best available in their sector and the destructive testing merely provoked an intermittent fault on one channel, so they are still the cans of choice. On CD and MP3: All kinds of rock, d&b and dubstep stuff with no physical object (cd or vinyl) and no tracklisting on paper. Ho hum, we live in interesting times.